The first post in the October Reflections is about beer. That golden goodness entwined with the orange goodness of pumpkin (the beer isn’t really orange, more a deep amber). I have tried two pumpkin ales made by two local companies: Lighthouse Brewery and Phillips Brewery. Here is a side by side comparisons. They are now compared. Just kidding. Lighthouse Pumpkin Ale: The first sip you get a punch of pumpkin flavour but after a few more sips, it becomes more and more subtle The beer is darker than the Phillips but is still a fairly light ale. The after taste is not really that pleasant and by the end of the glass, I was over it. Phillips Crooked Tooth Pumpkin Ale: The first sip is very subtle. You don’t immediately get the pumpkin flavour. It appears as more of a pumpkin pie, minus the crust, after taste. The beer is quite smooth and it is a light ale. The pumpkin is not overwhelming but that after taste leaves a nice after taste without being powerful. Very nice. Verdict: I tried the Phillips Crooked Tooth a couple of years ago and I didn’t like it. But that was before I tried flavoured beers or darker beers. I’m glad I gave it another try because I’m quite impressed. Between the 2, the Phillips is much better. The overall pumpkin flavour is smooth and not overpowering and the beer itself is light, fresh and crisp. Happy Autumn beer indulgence! 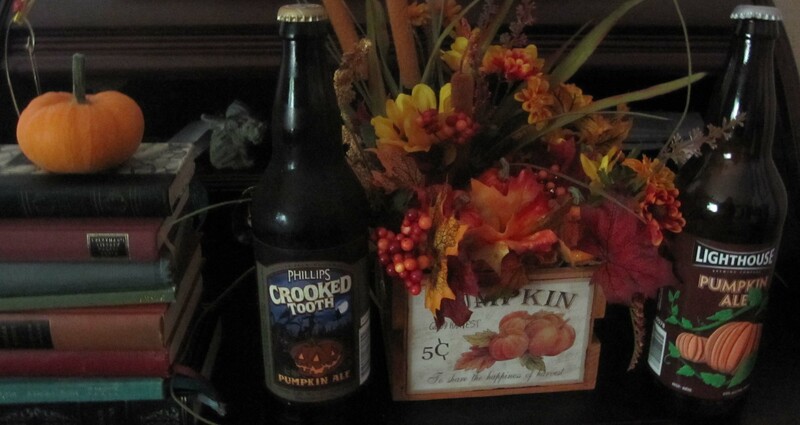 This entry was posted on October 2, 2012 by Denise in 31 Days of Halloween and tagged Beer, Beverages, flavoured beers, Halloween, light ale, Pumpkin.